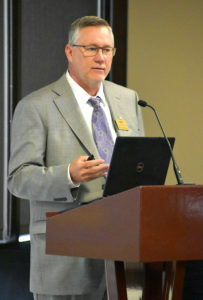 The Oklahoma Municipal Power Authority story was told during an annual luncheon with state legislators in Oklahoma City on March 27. 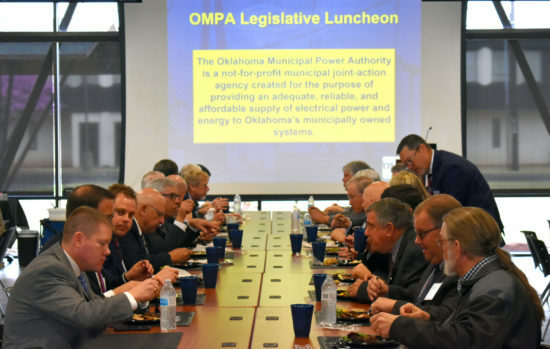 This was the third straight spring for OMPA to host such a luncheon, which provides the Authority an opportunity to educate legislators on the role of a joint action agency and the value the state’s municipal utilities bring to the communities they serve. OMPA invites all of the state’s legislators to the event. General Manager Dave Osburn and Board Chairman Charles Lamb each spoke to a large group that also included staff representatives from member cities and towns served by OMPA. At the request of cities and towns looking to control their own power supply, the Authority was created by the state legislature in 1981, and began serving power to an original 26 members in 1985. Since so much time has passed since the creation of OMPA, staff has recently made an extra effort to educate legislators on the Authority’s role and its mission. This luncheon is accompanied by smaller-scaled events throughout the year. An update was provided on the growth of OMPA, which includes the addition of one member in 2016, two in 2015 and two in 2011. An update also was provided on the resource portfolio of OMPA, which includes coal, natural gas and renewables like wind and hydro. That prompted another discussion regarding solar power and its potential future in the state. OMPA encourages its member cities and towns to stay engaged with their local state legislators, reminding them how decisions made at the Capitol can impact their municipal utilities, which can drastically impact their communities.